The town of Castle Rock is the county seat of Douglas County, Colorado, United States and is named after the prominent, castle tower-shaped butte near the center of town. It is part of Colorado's Front Range Urban Corridor and is located roughly 28 miles (45 km) south of downtown Denver and 37 mi (60 km) north of Colorado Springs. As of the 2010 census, the town had a population of 48,231. The region in and around Castle Rock was originally home to Native Americans of the Arapahoe and Cheyenne nations. They occupied the land between the Arkansas and South Platte Rivers. One of the first homesteaders in the area near today's Castle Rock was Jeremiah Gould. He owned about 160 acres (0.65 km2) to the south of "The (Castle) Rock." At that time, the settlement consisted of just a few buildings for prospectors, workers, and cowboys. In 1874, Jeremiah Gould donated 120 acres (0.49 km2) to the new town that was also now home to the Douglas County government. For the beginning the six streets named Elbert, Jerry, Wilcox, Perry, Castle and Front were laid out to build the actual town of Castle Rock. The Courthouse Square was defined and about 77 lots, each 50 by 112 feet (34 m), were auctioned off for a total profit of US$3,400. Castle Rock is located at (39.372212, -104.856090) at an elevation of 6,224 feet (1,897 m). Located in central Colorado at the junction of Interstate 25 and State Highway 86, Castle Rock is 28 mi (45 km) south of downtown Denver and 37 mi (60 km) north of Colorado Springs. East Plum Creek, a stream within the South Platte River watershed, flows generally north through Castle Rock. Hangman's Gulch, which runs northwest then west around the north side of the town center, drains into East Plum Creek as do multiple unnamed gulches in the southern and western areas of town. McMurdo Gulch and Mitchell Gulch run north then northeast through eastern Castle Rock and drain into Cherry Creek east of town. Castle Rock is within the Colorado Foothills Life Zone. The hillsides are covered with large meadows of grass, small plants, scattered juniper trees and open ponderosa pine woodlands. Other trees common in the area include Gambel oak (scrub oak or oak brush) and pinyon pine. Local wildlife includes the American badger, American black bear, bobcat, coyote, Colorado chipmunk, gray fox, mountain cottontail rabbit, mountain lion, mule deer, pocket gopher, porcupine, and skunk. Birds that can be found in the area include the golden eagle, peregrine falcon, sharp-shinned hawk, black-billed magpie, red-tailed hawk, pinyon jay and western tanager. According to the United States Census Bureau, Castle Rock has a total area of 33.79 square miles (87.5 km2), all of it land. Lying within the Front Range Urban Corridor, the town is part of the greater Denver metropolitan area. Castle Rock borders three communities, all to its north; from west to east, these are Castle Pines Village, the city of Castle Pines, and The Pinery. Other nearby communities include Franktown to the east, Larkspur to the south, Perry Park to the southwest, and Sedalia to the northwest. Castle Rock experiences a semi-arid climate (Köppen BSk) with cold, dry, snowy winters and hot, wetter summers. On average, the town receives 18.79 inches (477 mm) of precipitation annually. Snowfall averages 61.8 inches (157 cm) per year. On average, January is the coldest month, July is the hottest month, and August is the month with the most precipitation. The hottest temperature recorded in Castle Rock was 99 °F (37 °C) in July 1973; the coldest temperature recorded was −35 °F (−37 °C) in January 1963. The median income for a household in the town was $85,461, and the median income for a family was $95,973. Males had a median income of $66,993 versus $47,087 for females. The per capita income for the town was $34,089. About 4.0% of families and 6.2% of the population were below the poverty line, including 8.2% of those under age 18 and 6.2% of those age 65 or over. Castle Rock is the 17th most populous municipality in Colorado and is the center of the burgeoning urbanization of the county. Many of Castle Rock’s residents work in the Denver Technological Center, better known as "The Denver Tech Center" (DTC), which is a 15 minute drive north on I-25. Downtown Denver and Denver International Airport are both approximately a 40 minute drive from Castle Rock. As of 2011, 78.2% of the population over the age of 16 was in the labor force. 0.4% was in the armed forces, and 77.7% was in the civilian labor force with 72.6% employed and 5.1% unemployed. The composition, by occupation, of the employed civilian labor force was: 48.0% in management, business, science, and arts; 25.8% in sales and office occupations; 14.7% in service occupations; 6.4% in natural resources, construction, and maintenance; 5.2% in production, transportation, and material moving. The three industries employing the largest percentages of the working civilian labor force were: educational services, health care, and social assistance (15.5%); professional, scientific, and management, and administrative and waste management services (13.2%); and finance and insurance, and real estate and rental and leasing (12.6%). The cost of living in Castle Rock is above average; compared to a U.S. average of 100, the cost of living index for the town is 106.3. As of 2011, the median home value in the town was $278,000, the median selected monthly owner cost was $2,067 for housing units with a mortgage and $492 for those without, and the median gross rent was $1,069. Castle Rock is a Home Rule Municipality with a council-manager form of government. The town council consists of seven members, each representing an election district, elected to two-year terms. One member, appointed by the council, serves as mayor, presiding over council meetings, and another member serves as mayor pro tem. The mayor presides over council meetings and casts one vote, like other council members. The council sets policy for the town, adopts ordinances, approves the town budget, makes major land-use decisions, and appoints key town government staff including the town manager, town attorney, municipal judge, and members of town boards and commissions. The town manager supervises all departments, prepares and implements the town budget, and works with the council to develop policies and propose new plans. Tax revenues are used to provide general government, fire, police, parks maintenance and programs, street maintenance and operations, public transit, support for recreation and planning and code enforcement services. The town also provides development services, golf, water and sewer services to residents through self-supporting enterprise funds. As the county seat, Castle Rock is the administrative center of Douglas County. The county courthouse, the Douglas County Justice Center, is located north of downtown, and most departments of the county government base their operations in the town. As of 2013, Castle Rock lies within Colorado's 4th U.S. Congressional District. For the purposes of representation in the Colorado General Assembly, the town is located in the 4th district of the Colorado Senate and the 45th district of the Colorado House of Representatives. Douglas County School District is based in Castle Rock and operates 18 public schools in the town. These include ten elementary schools, two middle schools, two charter schools, one magnet school, one alternative high school, and two high schools: Castle View High School and Douglas County High School. In addition, there are three private primary schools located in Castle Rock: The Rock Academy (Grades PK-3), School of the Rock (PK-8), and Woodlands Academy (1-8). The Douglas County Libraries public library system is based in Castle Rock, co-located with the local branch library, the Philip S. Miller Library, south of downtown. The Miller Library includes the Douglas County History Research Center and offers several educational and recreational programs to the public. Interstate 25 and U.S. Route 87 run concurrently north-south through Castle Rock. U.S. Route 85, also a north-south route, enters the town from the northwest, meeting I-25 at Exit 184; south of the exit, it runs concurrently with I-25 and U.S. 87. Colorado State Highway 86, an east-west route, enters Castle Rock from the east, then turns north and west as Founders Parkway, terminating at its junction with I-25 at Exit 184. For local transportation within Castle Rock, the town government sponsors a voucher program for reduced-fare taxi service. This service is available to town residents who are disabled or who do not have access to a vehicle. In addition, the Castle Rock Senior Center offers a shuttle service for resident senior citizens. BNSF Railway and Union Pacific Railroad each have a freight rail line that runs through Castle Rock. Both lines run parallel to U.S. 85. The Intermountain Rural Electric Association, based in nearby Sedalia, provides electric power. Black Hills Energy provides natural gas service. Waste Management and other businesses provide trash removal. The town government's Utilities Department oversees water provision, distribution, and infrastructure maintenance. Within town there are several medical offices, an urgent care and an emergency room. Castle Rock Adventist Hospital, a full service hospital, opened on August 1, 2013. The 50 bed hospital offers comprehensive health care to the Douglas County area, with labor and delivery suites, NICU, orthopedic surgery, ICU and medical imaging. Castle Rock has a weekly newspaper, The Douglas County News-Press. Castle Rock is part of the Denver radio and television market. Radio station KJMN is licensed to Castle Rock, but broadcasts from Denver playing a Spanish Adult Hits format on 92.1 FM. Denver radio station 850 KOA, which broadcasts a news/talk and sports format, operates its 50,000 watt transmitter from a site 10 miles northeast of downtown Castle Rock, in the town of Parker. Another Denver station, KEZW "Studio 1430", a CNN affiliate with a nostalgia music format, operates its transmitter from Highlands Ranch, 13 miles north of downtown Castle Rock. NPR programming can be heard on Colorado Public Radio's KCFR-FM. Castle Rock is also served by the AM signal of KGNU, a non-commercial affiliate of PRI, Pacifica, and the BBC World Service, and which also provides diverse music programming. Television station KETD, an affiliate of the LeSEA network, broadcasts on digital channel 46. Licensed to Castle Rock, the station is located near Centennial, Colorado. Castle Rock's open space and parks comprise 27% the town’s total land area (5,415 acres (21.91 km2) of parks and open space / 20,224 acres (81.84 km2) total land area). Additionally, there are 56 miles (90 km) of soft-surface and paved trails. Parks - Baldwin Park, Bison Park, Butterfield Park, Castle Highlands Park, Castle North Park, Castlewood Canyon State Park, Centennial Park, Festival Park, Founders Park, Gemstone Park, Glovers Tot Lot, Matney Park, Metzler Ranch Park, Mitchell Gulch Park, Paintbrush Park, Plum Creek Park, Rhyolite Regional Park, Rosecrown Park. Trails & Open Space - East Plum Creek Trail, Gateway Mesa Open Space, Hidden Mesa Open Space, Memmen Ridge Open Space, Mitchell Creek Canyon Trail, Mitchell Creek Trail System, Native Legend Open Space, Quarry Mesa Open Space, Ridgeline Open Space, Rock Park, The Bowl. 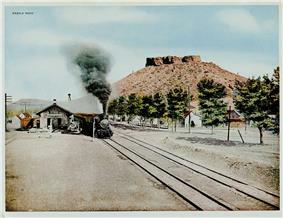 The Castle Rock Historical Museum is located in the former Denver and Rio Grande Railway depot building on Elbert Street. This building is purported to have been built in 1875. It is made of rhyolite taken from local quarries. In this museum visitors can see history of how Castle Rock changed over the years. From 1986 through 2006, a professional golf tournament was held in Castle Pines Village. The International, a PGA Tour event, was held in August at the Castle Pines Golf Club. Money magazine ranked Castle Rock No. 19 in the nation in its list of the “100 Best Places to Live in America" September 2011 . Ranking methodology was based on job growth, home affordability, safety, school quality, health care, arts and leisure, diversity and several ease-of-living criteria. Family Circle magazine ranked Castle Rock No. 1 in the nation in its list of the “10 Best Towns for Families," August 2010. The article shares the results of the magazine’s quest to identify "the best communities across the country that combine big-city opportunities with suburban charm" and "an ideal blend of affordable houses, good jobs, top-rated schools, wide-open spaces and a lot less stress." This is Castle Rock's second time making Family Circle's top ten list. In the August 2007 issue Castle Rock was ranked No. 9. SchoolDigger.com ranked Douglas County School District No.1 in the Denver Metropolitan Area and No.12 in Colorado based on 2009 test scores. (School district rankings were determined by averaging the rankings of individual schools within each of the 122 districts evaluated). Source: National Center for Education Statistics, U.S. Dept of Education, and Colorado Department of Education. View of Pikes Peak from Rock Park in Castle Rock. View of Devil's Head Lookout from Ridgeline Open Space in Castle Rock. View of Mount Evans from Rock Park in Castle Rock. View from Rock Park Lookout Area in Castle Rock. View of Pikes Peak from I-25 in Castle Rock. View of The Meadows neighborhood taken from Daniels Park. Castle Rock as seen from I-25. Hiking trail at Rock Park in Castle Rock. ^ a b c d e f g h i "American FactFinder 2". ^ a b "City Distance Tool". ^ "Physiographic provinces of Colorado". Colorado Geological Survey. Retrieved 2013-10-03. ^ "Map of Major Topographic Features in Colorado". Colorado Geological Survey. Retrieved 2013-10-03. ^ "History of Castle Rock". Town of Castle Rock, Colorado. Retrieved 2013-10-03. ^ a b "Castle Rock (map)". ^ "OMB Bulletin No. 13-01". ^ a b "Colorado: 2010 - Population and Housing Unit Counts". ^ a b "NOWData - NOAA Online Weather Data". ^ a b "Average Weather for Castle Rock, CO". ^ "Climatography of the United States No. 20". ^ "Castle Rock, Colorado". City-Data.com. Retrieved 2013-10-19. ^ "Town Government". Town of Castle Rock. Retrieved 2010-07-03. ^ "Town Manager's Office". Town of Castle Rock. Retrieved 2010-07-03. ^ "Our Locations". Douglas County Government. Retrieved 2013-10-25. ^ "Departments". Douglas County Government. Retrieved 2013-10-25. ^ "Colorado - Congressional Districts". The National Atlas of the United States of America. ^ "Colorado Webmaps - My Neighborhood". ^ "Private Schools in Castle Rock". Greatschools. Retrieved 2013-10-19. ^ "Philip S. Miller Library". ^ "Local Transportation". Town of Castle Rock. Retrieved 2013-11-20. ^ "Colorado Statewide Rail System 2012 [Map]". ^ "Utilities/Services". Town of Castle Rock. Retrieved 2013-11-20. ^ "Utilities/Castle Rock Water". Town of Castle Rock. Retrieved 2013-11-20. ^ "Castle Rock Adventist Hospital". Retrieved May 20, 2013. ^ "Advertise with Us". Colorado Community Newspapers. Retrieved 2009-10-07. ^ "Contacto". Entravision Communications Corporation. Retrieved 2010-04-05. ^ "TVQ TV Database Query". ^ a b "http://money.cnn.com/magazines/moneymag/bplive/2011/snapshots/PL0812415.html". CNN. ^ "Castle Rock among '10 best' for families in U.S.". Castle Rock Chamber of Commerce. Archived from the original on Juuly 13, 2010. ^ Kilborn, Peter T. "http://www.forbes.com/2009/07/07/relocate-relocation-cities-lifestyle-real-estate-affordable-moving_slide_6.html". Forbes. ^ "Biography for Amy Adams". ^ "Biography of Artist Kirsten Bomblies". Artists for Conservation. Retrieved 2011-09-29. ^ "Father John Lewis Dyer". oakdene.org. Retrieved January 19, 2014. ^ Hanley, Reid (1992-06-21). "Sports Psychologist Helps Hallberg Stay Focused On Task At Hand". ^ Fox, Margalit (2007-08-31). "Edward Seidensticker, Translator, Is Dead at 86". ^ "Ann Strother". UConn Hoop Legends.